deeternet® Wireless Sensor System Base Station - Deeter Electronics Ltd. deeternet® Wireless Sensor System Base Station - Deeter Electronics Ltd. 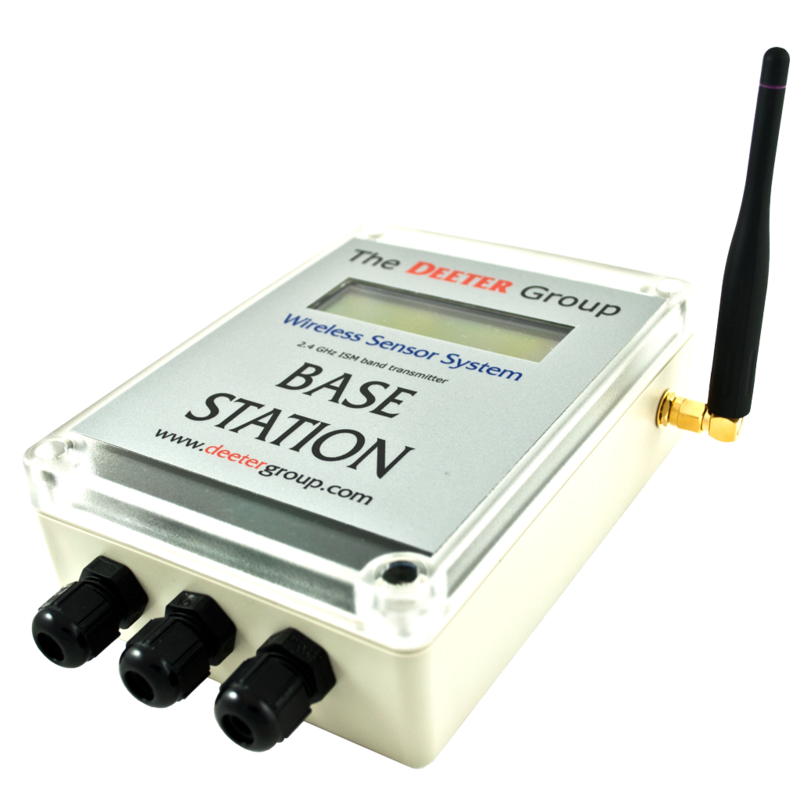 The Base Station is at the heart of the Deeter Wireless Sensor System, designed to communicate with a Deeter Sender or LVCS-RF and convert remote sensor input signals into useful outputs. The Base Station acts as the coordinator for a wireless network. It operates on one of 16 radio frequency channels available in the 2.4GHz ISM band. Range can be more than 1km, subject to environmental factors, and greater distances can be attained with the use of a Deeter Wireless Router. The internationally recognised IEEE 802.15.4 protocol allows several networks to share the same space without interfering with each other. Four Open-collector transistor outputs. These may be used to drive external relays (for example a Deeter Dual Level Controller) for pumps and alarms. The outputs will sink up to 50mA at 40V and are short-circuit protected. A 4-to-20mA current-loop driver. This allows interfacing with industrial process controllers or the range of Deeter Current Loop Indicators. A serial communications channel provides full-duplex RS232 and half-duplex RS485 transceivers. This allows software to be developed for linking to PCs, dataloggers, PLCs and so forth (Future feature). A USB connection is also available. The Base Station has three internal push-button switches and a 2-line by 16-character LCD. The buttons are accessible with the lid removed and are used in conjunction with the display to select installation options during initial setup. Once the system has been installed it will continue to operate without any need for user intervention. The Base Station is housed in a rugged ABS enclosure with an external antenna. It has cable glands for power input and signal outputs. 2) The Base Station is supplied with a 12V DC external wall-mounted mains adapter power supply. This can operate on 100-240V AC 50-60Hz mains. It can supply 0.5A. 3) Conform to European ETSI Limits.